We are committed to meeting your lighting specification requirements. We have supplied landscape lighting, bollards, tree lights, and commercial street lights to municipalities, universities, the government, contractors, and businesses for more than 40 years. Can't find what you are looking for? Give us the opportunity to create it. Many of our designs were created for specific projects. Classic all polymer wall mounted sconces offer elegant accent lighting to any building or landscape. Whether used by themselves or along with our Washington or New England post series, Classic sconces will add subtle beauty to your project. The Victorian Wall Arm (VWA) is molded of linear low density polyethylene and includes mounting bracket and hardware. It can be used with the 12" and 13" globes and fitter or with other 3" tenon. Virtually indestructible, architectural grade rotationally molded designer polymer resin. Single piece weatherproof designer polymer resin body is UV protected from sun light. Polyethlene, Polycarbonate and Acrylic globes available with this sconce. Round, Acorn or Victorian style. Numerous lamp options are available to accommodate your specification requirement. Recommended LED Bollard Lamp. See below. Molded in colors, no painting required. Custom colors available upon request. 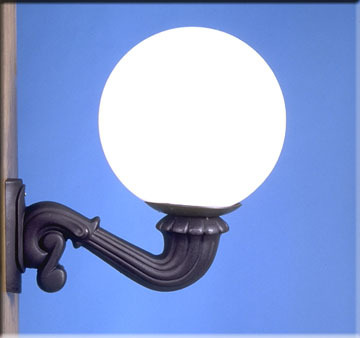 Classic wall mounted sconces offer elegant accent lighitng to any building or landscape. Whether used by themselves or along with ur Washington or New England post series. Classic sconces will add subtle beauty to your project. See manufacturers Limited Factory Warranty for details. Shipping and handling charges must be paid by purchaser.